The skin is anesthesia end with some topical numbing cream. Then tumescent anesthesia is given throughout the area where the Duolift threads are to be inserted. Duo threads with barbs are then inserted from above the hairline going down to the mid and lower face in order to lift the laugh lines and droopy cheeks. For each barb thread another thread with "clutch" is then inserted next to it to help strengthen the hold of the skin by the threads. 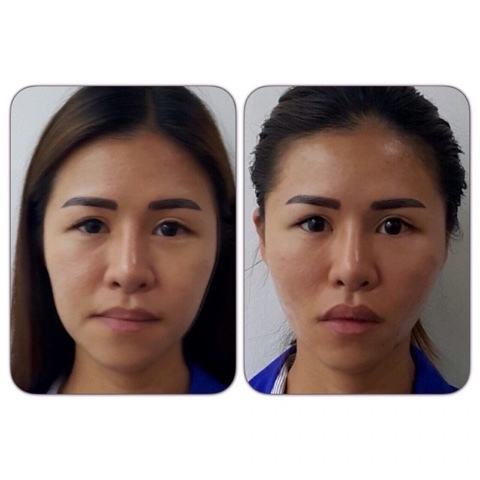 The no of pairs inserted depends on how much hold is required and wether the patient wants to V shape her face or to lift her sagging skin. 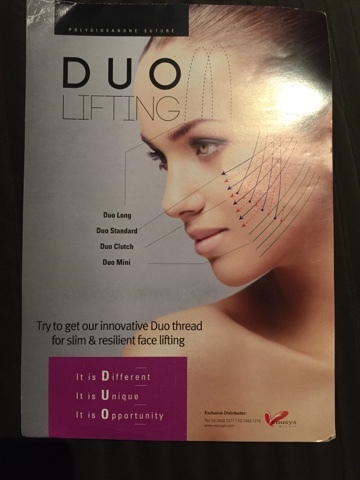 For those who need more lifting, threads are also inserted from the mid face area right down to the jawline. Results, despite the swelling and potential bruising, is immediate. DuoLifting is similar to MINT lifting. Both are conducted by me in our centers and is a outpatient day procedure. They are available at our clinic in En-Hanze Centre as well in Global Drs Aesthetic Clinic. Call 1300-88-1788 for appointment if you are interested.